The LameStation graphics engine, providing a drawing surface and basic drawing functions. Demos for this object can be found in the /demos/graphics/ folder of the SDK. gfx.Sprite - Draw a screen-sized image to (0,0). gfx.Clear - Clear the screen to black. gfx.Fill - Fill the screen with a repeating word color. gfx.InvertColor - Invert black and white pixels when drawing images. gfx.Map - Draw a tile-based level map. gfx.SetClipRectangle - Change the portion of the screen that will be drawn to by LameGFX. gfx.Sprite - Draw an image of any size to the screen. gfx.Start - Initialize the LameGFX library. gfx.WaitToDraw - Wait until the last drawing operation has completed before continuing. gfx#SCREEN_H - Height of the screen in pixels. gfx#SCREEN_W - Width of the screen in pixels. Call gfx.Start to start LameGFX. It should only be started once at the beginning of your program, before all drawing operations, and should be connected to LameLCD right away. Clear the screen to black with gfx.Clear, or fill to any color with gfx.Fill. Call gfx.Sprite to draw images to the screen. If an image is exactly 128x64 pixels, use gfx.Blit for much faster drawing. Use gfx.Map to draw level maps directly, or you can use LameMap for more functionality. gfx.InvertColor changes all black pixels to white, and vice versa. This is useful as a cool effect or reusing graphics. LameGFX supports clipping, which allows you to limit the part of the screen that functions will draw to. This is useful if, for example, you want to show half of an image, or a progress bar that can fill up. Call gfx.SetClipRectangle to set the clipping region, which is a rectangle from (0,0) to (128,64) by default. It will remain that size until you reset it to its normal size. The first point is inclusive, while the second is exclusive. That means that a region of (0, 0, 128, 64) allows you to draw on pixels from (0,0) to (127,63). The second point must be to the right and down relative to the first, otherwise the clip rectangle will be of size (0,0), or not drawable. You can draw to the LameGFX buffer directly. First, you must enable access. This is done by grabbing its address during setup. You can now access the 2048-byte block of memory pointed to by buffer. LameGFX will wait until the previous drawing command is finished before starting a new one. However, advanced users may want to create their own drawing functions. If so, use gfx.WaitToDraw to ensure your function plays well with LameGFX. LameGFX has its own format for sprites. Each sprite has the same structure. frameboost - The size of a frame in bytes, or width * height / 4.
width, height (0-65535) - The width and height of each frame in pixels. Note: The width is rounded to the next nearest 8, so for an image 6x6 pixels, frameboost = 8 x 6 / 4. 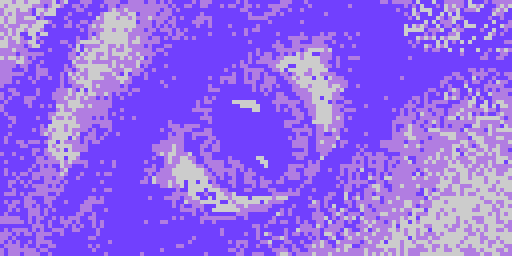 Each pixel is two bits, so there are 8 pixels per word. Image data should be organized left-to-right, top-to-bottom, with frameboost / 2 words for each frame. LameGFX supports 3 visible colors and one transparent color that is never drawn. Sprites can contain multiple images, or frames, so that they can be animated by your program. The first frame is frame 0. LSImage or the command-line img2dat can be used to convert images into sprite objects, or they can be written by hand.